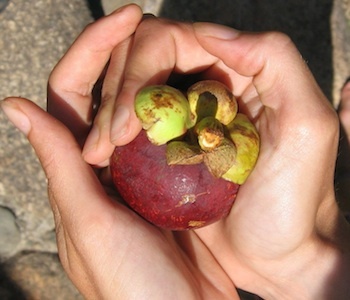 Mangosteens can be opened easily by holding the fruit in the palms of your hands with the stem facing upwards. Gently apply pressure to the middle of the fruit from both sides. Once the fruit splits open, slightly twist and pull the two halves apart. Usually all the fruit will stay in one half. Alternatively you can cut around the fruit with a knife and twist it open. Scoop out the white flesh and savour this taste sensation. 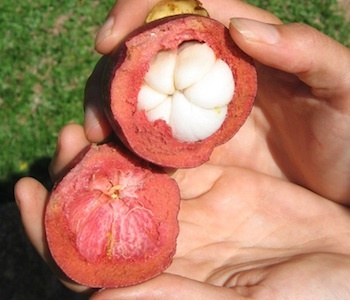 Ideally mangosteens are best eaten as they are when first opened. They are also delicious added to fruit salads or as dessert toppings. If the flesh from the fruit is treated with a little lemon or lime juice they maintain their colour and keep well in the fridge, or they may be frozen for later use. 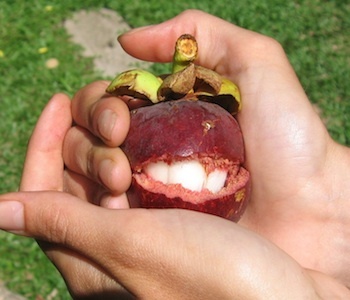 Australian grown organic Purple Mangosteens are hard to resist.